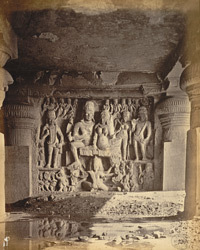 Photograph of a sculpture of Ravana shaking Kailasa in the Dumar Lena rock-cut temple at Ellora in Maharashtra, from the Archaeological Survey of India Collections, taken by Henry Mack Nepean in 1868. The spectacular site of Ellora is renowned for its series of Hindu, Buddhist and Jain cave temples excavated into the rocky façade of a cliff of basalt. The works were carried out under the patronage of the Kalachuri, the Chalukya and the Rashtrakuta dynasties between the 6th and 9th centuries. Dhumar Lena is one of the earliest caves of the Hindu series and dates from the Kalachuri period, early 6th century, as denoted by the similarity between its columns and those at the Elephanta cave. Two sculptures of lions guard the south entrance and large-scale sculpted wall panels on the sides represent Shaivite myths. This view shows the west panel with Shiva and Parvati seated in their abode on the Kailasanatha mountain, disturbed by the demon Ravana.